In this paper, the sorption of the heavy metal ions (Sr2+, Ba2+, and Cs+) on the hybrid CNF/TiO2 and CNF/Fe2O3 materials is considered. The colloid–chemical properties of the TiO2 and Fe2O3 nanoparticles and carbon nanofibers in the dispersions were studied, and interaction between nanoparticles and nanofibers in accordance with the hetero-coagulation principle was estimated. The carbon nanofibers used were prepared by catalytic chemical vapor deposition of a propane–butane mixture over the nickel–copper catalyst and then functionalized by boiling in a mixture of concentrated hydrochloric and nitric acids. 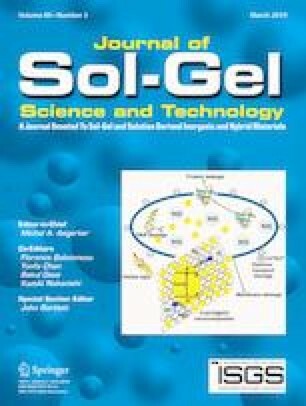 The TiO2 and Fe2O3 nanoparticles were synthesized via a sol–gel technique. The sol was mixed with carbon nanofibers. After drying, the hybrid materials with a uniform distribution of the oxide NPs along the nanofiber’s surface were obtained. The CNF-to-metal oxide ratios were 10:1 and 1:1. The samples were characterized by a set of physicochemical methods. The hybrid CNF/TiO2 system was found to have a synergetic effect toward the sorption of the metal ions from their aqueous solutions. Hybrid materials CNF/Fe2O3 and CNF/TiO2 were synthesized by ex situ method. The colloid–chemical properties of metal oxide NPs and CNFs in the dispersions were studied. Metal oxide NPs are coaxially coated and uniformly distributed on the CNF surface. Sorption of Sr2+, Ba2+, and Cs+ on the hybrid materials is considered. The hybrid CNF/TiO2 was found to have a synergetic effect toward the sorption of Sr2+ and Cs+. This research was supported by a grant from the Russian Foundation for Basic Research (project no. 18-29-19053_mk).